The word “quinoa” has been thrown around the food world more often in the last year than ever before. There are cereals made with the mystery ingredient, chefs are experimenting with it, and it has appeared in major magazine publications around the country. So what is quinoa, what can it do for you, and most importantly, what does it taste like? Let’s start at the beginning and find out where quinoa comes from. The powerful grain is not new to the mountains and valleys of Bolivia, Peru, Ecuador and Chile, where they have been eating and harvesting the grain for 5,000 years. Quinua, as it is called in the Inca language, means “mother grain” because it was, and still is, a staple crop among inhabitants of those regions of the world. Unfortunately, now that more first-world countries have discovered the magical grain, the price for the original quinoa growers has increased and therefore, many of the poorer residents can no longer affordwhat was once a fairly unknown and affordable delicacy. 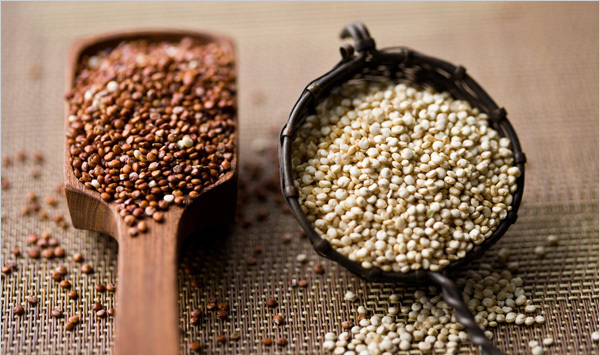 The reason behind quinoa’s newfound fame among increasingly health-conscious countries, specifically the United States, is because of its multiple health benefits. It is a complete protein, which is rare for a plant food. A food must contain all nine essential amino acids to be considered a protein, and quinoa not only does this, but also serves as an excellent source of potassium. Changing diet trends are another reason quinoa has been on the foodie radar in recent times. Because it is both gluten-free and a good source of protein, it is an ideal food for vegans, vegetarians and anyone who avoids gluten. The health benefits of quinoa also include a high ratio of protein to carbohydrates, meaning it will fill you up faster without adding a lot of carbs to your diet. This makes it a great substitute for rice if you are trying to eliminate starches without losing nutrition. And while it is commonly grouped with grains, quinoa is actually a chenopod, which is closely related to beets, spinach and tumbleweeds (yummy). While it is related to the tumbleweed, quinoa does not taste like something that belongs in the middle of the Fievel Goes West. It is not only tasty on its own, but versatile enough that it can play a part in many recipes. It makes a great breakfast, lunch, dinner and even cookie. Experiment with the recipes below and discover the power of quinoa. Toasted Quinoa Beet Salad Total time: 50 minutes, serves 4 The inspiration for this salad came from The Adventurer at Life Alive Cafe. 1. Cook quinoa as directed on package, which takes about 20 minutes. While quinoa is cooking, place beet cubes, corn, broccoli and kale into a medium saucepan with just enough water to cover the top of the vegetables. Bring to boil to soften the vegetables and simmer until all vegetables are soft, about 10 minutes. 2. Place tofu in a frying pan with sesame oil, ginger and shoyu. Fry over medium heat and until lightly browned, stirring to keep it from sticking. Add water if it begins to stick and burn. It should take about 10 minutes to brown. 3. When quinoa, vegetables and tofu are finished, combine in one bowl and mix until evenly combined. Add almonds. Place in serving bowls and top with extra sesame oil and shoyu to taste. Garnish with sesame seeds. I found this recipe on Pinterest and, just as the blog advocates, wanted to try it out. I had never thought to use quinoa as a cookie dough base, but this worked surprisingly well– give it a shot! 2. Combine quinoa, peanut butter, maple syrup and oats in a large bowl. Mix until all ingredients are completely incorporated and the dough begins to stick together. This will happen when the peanut butter has spread throughout the quinoa. 3. Add in coconut and chocolate chips and stir to incorporate evenly. 4. Roll into balls. If you want flat cookies, press gently with fingers. 5. Place on baking sheet and bake for 20 minutes. The cookies should start to crisp and brown, both on the bottom and top. These are good both straight out of the oven or cooled. They crumble a little more when they are hot, but who can resist a fresh cookie?